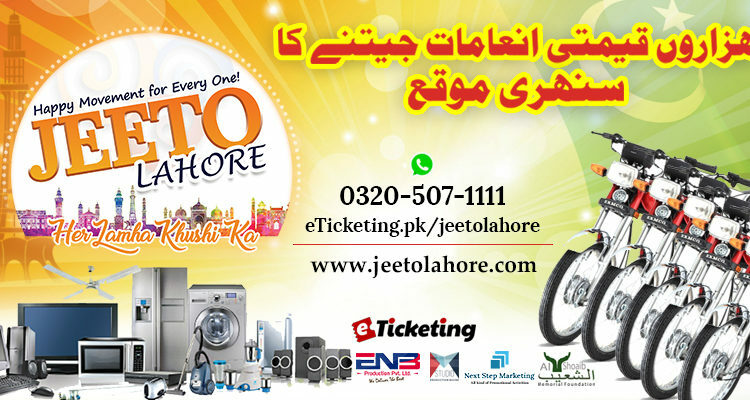 Jeeto Lahore, the Biggest Game Show of the City will be presented on 30th July 2017 at Alhamra Cultural Complex near Gaddafi Stadium in Lahore. It is being organized by ENB Production Pvt. Ltd. and M Studio Production House. Motto of this family game show is “Her Lamha Khushi Ka”. The purpose of the show is to provide entertainment by playing different games, competitions, lucky draw and refreshments. Lots of gift hampers and prizes will be given to the audience with the aim of “Happy Moment for Everyone”. 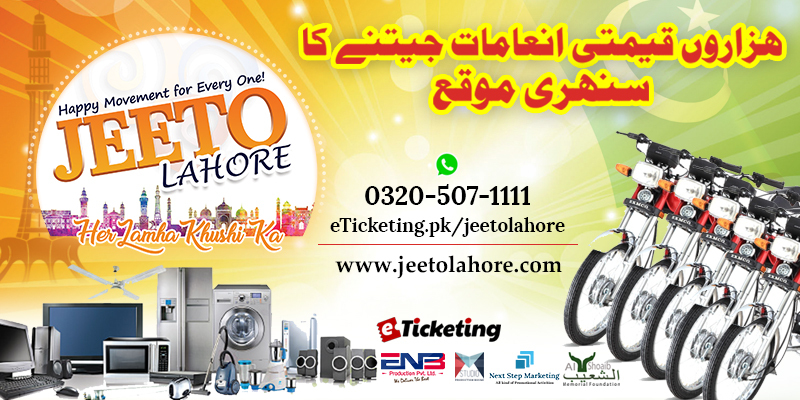 Jeeto Lahore is a family game show including entertainment,quiz and competition segments. Every person joining the event will be given some gift. There will be lucky draw to award precious prizes. People can participate in quiz, competitions and games to win exciting items. Cars, bikes, mobiles, LED TVs, electronics and other items will be on the line. A gathering of about 4000 people is expected during Jeeto Lahore. Hundreds of gifts will be distributed during the show. It will provide the platform for your company advertisement during the show. Campaigns include placing the logo’s on gift hampers, staff T-Shirts promo on SMD Screens, cable advertisement, media coverage and lots more. It will definitely make your brand / company more famous. ENB Production Pvt Ltd and M Studio Production House are presenting Jeeto Lahore to the residents of Lahore and nearby cities. Come have joy of winning fabulous prizes in the show. So be ready on 30th July 2017 for the extravaganza event. Participate in the at Alhamra Cultural Complex near Gaddafi Stadium Lahore.